Getting your haircut is always exciting. The moment when you walk out of the hairdressers or barbers knowing you’re looking your best, just can’t be beaten. But wouldn’t it have been so much better if you could have had a smashing cup of Two Chimps Coffee while you were there? Well, a barbershop in Glasgow is offering just that! Introducing… Brush Barbers! This barbershop in Glasgow offers extremely high-quality men’s haircuts and grooming services. Established in 2017, Brush Barbers currently has three very talented barbers; each with their own individual style and skills in barbering. Co-founder of Brush Barbers, Husso, has over ten years of experience in barbering and is very passionate about what he does. Brush Barbers was opened to offer customers an entirely new experience when getting their haircut. Husso makes a point of creating a style that is unique to each customer that walks through his door. To accompany Husso, Brush Barbers currently has two other creative barbers; Dino and Tracy. Dino has over ten years of experience in barbering and has seen his career take him across Europe and to some of the top hair salons in Glasgow. His work has been recognised by a number of very high profile clients. Tracy has a Level 5 Barber degree and was educated by Husso at the Great British Barbering Academy. She is incredibly passionate about barbering, and it shows in her work. Husso is an International Barber Award UK Finalist for 2017 and 2018. Brush Barbers as a business was also a finalist at the Glasgow Retail Business Awards 2018. On behalf of the Great British Barbering Academy, Husso was at the Scottish Hair & Beauty Show 2018. At their stand, he gave live hair cut and style demonstrations, as well as recommendations of various hair and grooming products. Husso was also a finalist in 2018 for qualifying at the 101 International Barber Awards in London. He competed against ten other finalists to represent the UK at the European final. 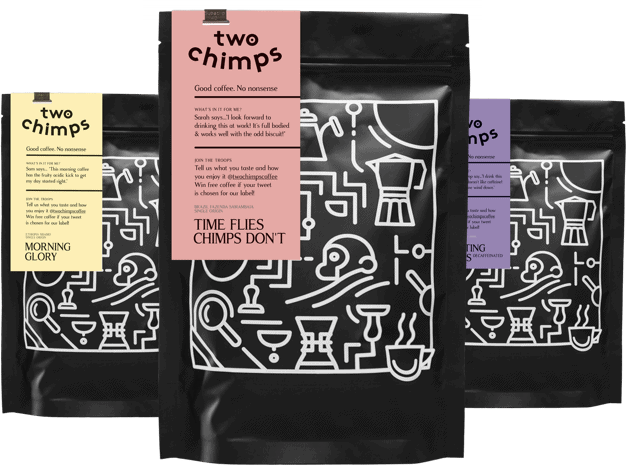 Here at Two Chimps, we not only supply gorgeous coffee to individuals and families direct to their door, but we are also wholesale coffee suppliers. To compliment Brush Barbers’ incredible hair and grooming services, they now offer their customers Two Chimps Coffee! The coffee they have chosen currently is ‘Box of Frogs’ from El Salvador. This will be served through their espresso machine to their customers while they wait and during their hair or grooming experience. ‘Box of Frogs’ is a super creamy coffee with a sweetness similar to white chocolate. It’s sure to be a winner with Brush Barbers clients. We’re so excited to have our coffee in such an awesome barbershop in Glasgow, and we can’t wait to see what this amazing brand gets up to this year. Brush Barbers is definitely on its way to being one of the top barbershops in the country. Like the sound of ‘Box of Frogs’? Or maybe you want to try another of our coffees. Head over to the shop for a full list.